Corns and calluses are usually formed in areas where we have continuous friction and pressure, especially under the feet. Corns and calluses forming is the skin’s way of protecting itself from all the friction and pressure. That’s all good and nice but corns and calluses are ugly and make the feet unattractive. They also make showing off your lovely gams in sandals and flip-flops a tad difficult. 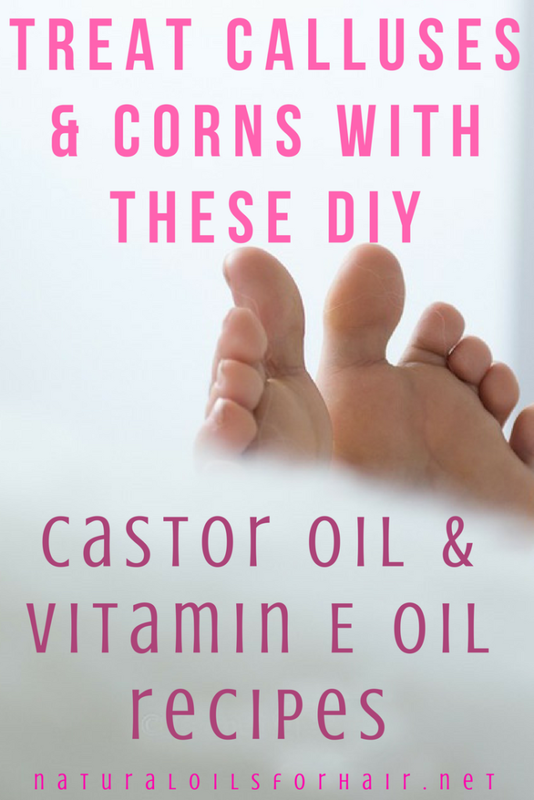 The good news is there are many home remedies you can engage to treat corns and calluses and get rid of them permanently. Corns and calluses are displayed as thick and rough areas, hardened raised bumps, which can be itchy and flaky, dry skin. They are rarely painful or dangerous but have been known to become inflamed and require medical attention. Not wearing hosiery with close fitting shoes. Using equipment that causes consistent pressure on specific locations. Once you eliminate or reduce all of the above, you should begin to see an improvement but when it comes to the corns and calluses already there, you will need to do some other things. Regular pedicures can help but I’m sure a lot of people can’t invest in pedicures every week. This is where the cost-friendly recipes below come in. Do not wear shoes that are too tight or uncomfortable. They are a pain to walk in and eventually lead to this problem. Wear hosiery with shoes as much as possible. This will provide an added layer of protection. Keep your feet well moisturized. Dry skin makes your feet prone to calluses. Read DIY Rescue Recipe for Dry Elbows, Knees & Feet. Use a pumice stone for your feet when you bathe every day. It only takes a few minutes so well worth the effort. Zenda Naturals Pumice Stone is a great option for this. 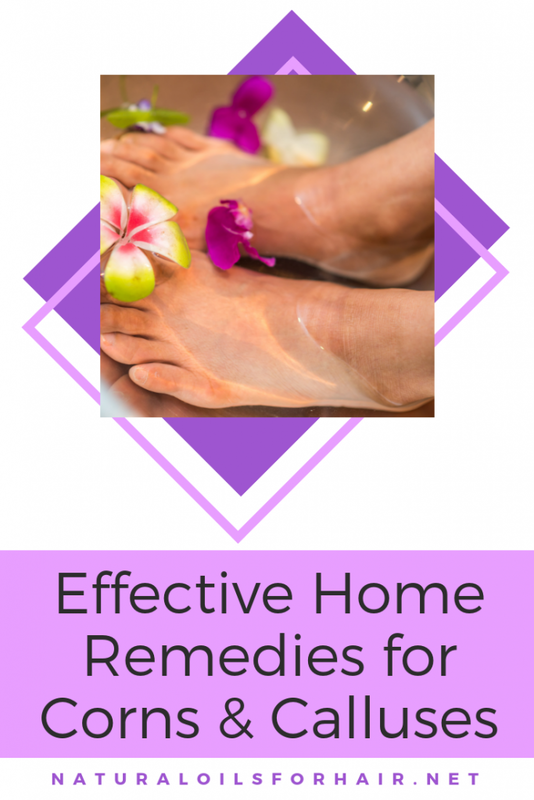 These home remedies are simple, budget-friendly and effective in getting rid of corns and calluses permanently. Use a combination of two or more of the treatments for even faster results. The list originally started as 2 recipes but I have expanded it to 5 recipes since this post was published. I have also improved the original recipes and added a few additional ingredients that will make it work better. Mix the castor oil and vitamin E oil in a plastic container. Place on top of a bowl of hot water and allow to warm up slightly. Once warm, remove from the bowl and add the lavender essential oil. Apply under and over your feet and toes. Apply between your toes as well. Really work the mix in; massage for several minutes until absorbed. Put on a pair of socks and leave on overnight. The next morning when you take off the socks, work a pumice stone like this one under your feet. Rinse and wash off. Repeat every day. Work the baking soda through a small mesh strainer like this one then pour into a clean bowl. Add in the castor oil and vitamin E oil. Mix together until it forms a consistent grainy texture. Apply under and over your feet. Massage for a few minutes. The next morning, massage again then rinse off with lukewarm water. Apply 1 – 2 drops of salicylic acid on each corn. Do the same on your soles and rub in then rinse your hands. Leave on for 5 minutes then rinse off with lukewarm water. Wash with mild soap and rinse again then moisturize with this balm. Repeat every other day for up to a month for best results. The salicylic acid will dry up the dead tissue and allow it to peel away safely after a few treatments. 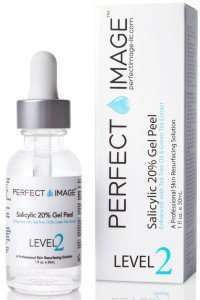 You can also use this treatment every day but if you use a stronger salicylic acid gel, then do it only once a week. Dissolve the Epsom salt in the basin of warm water then add in the lavender essential oil. Wash your feet then soak in the basin for 15 minutes. Afterward, use a pumice stone to slough off the dead skin cells. Rinse your feet and dry. 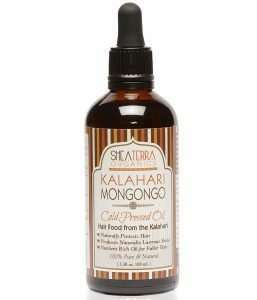 Apply the mongongo oil to your feet and rub in until absorbed. 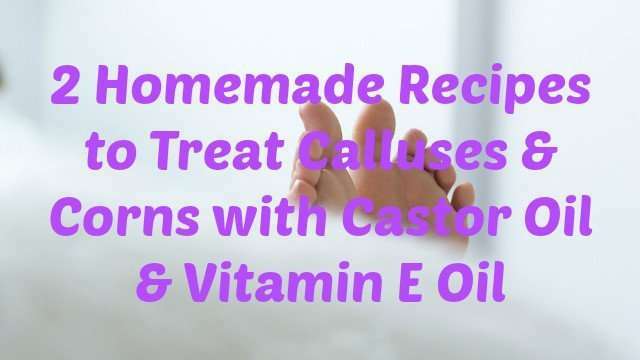 Do this treatment in the evening so your feet are up overnight. The Epsom salt acts as an exfoliant while mongongo oil contains essential fatty acids that are perfect for dry skin and forms a protective barrier. Mix the turmeric powder and maple syrup to form a paste. Add the castor oil and stir again. Apply to the corn and calluses and put your feet up to air dry. This will take about 15 – 20 minutes. Rinse off with lukewarm water then apply a moisturizing balm. You can use this recipe every day, or morning and evening if you have the time. Turmeric and maple syrup combines antimicrobial and soothing properties. 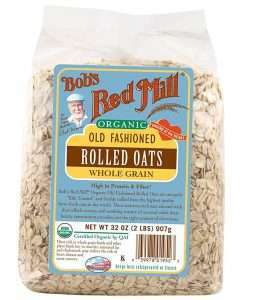 Boil the oatmeal in distilled water for a few minutes then strain into a clean bowl. Add the coconut oil and whisk with a fork. Wait until the mix is lukewarm then apply to your corns and calluses. Leave on for twenty minutes then rinse off with lukewarm water. Repeat every day if necessary. It takes time for these treatments to work especially if you have really thickened corns and calluses but be consistent with the treatment for at least 6 – 8 weeks. If symptoms persist even after trying all of above or you experience serious discomfort then it’s time to see a podiatrist for a more intense treatment. Let me know in the comments section if you try any of the recipes.